The Walking Dead’s 100th episode was a nice start to season 8. 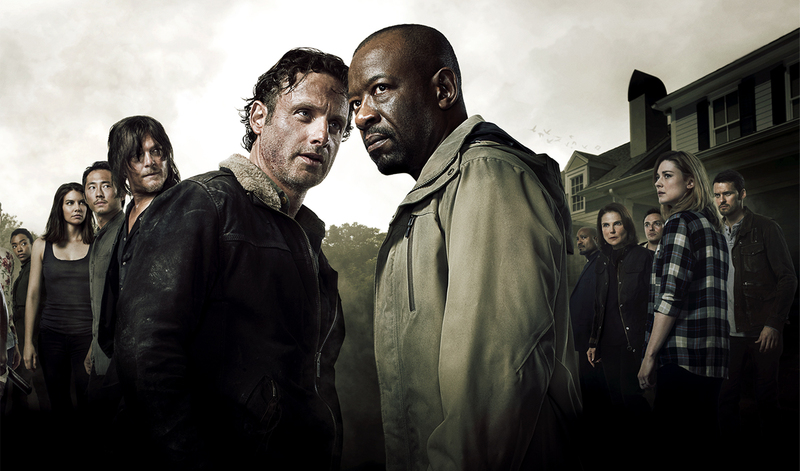 Directed by Greg Nicotero, the season premiere focused on the beginning of Kirkman’s comic titled All Out War. Alexandria and the Hilltop are all ready for the battle against Negan and his Saviors. It seems like it was forever since I last saw the cast and crew grace the NYCC stage, and with the anticipation and after effects of that, I know the events of last night’s episode will set the tone for the entire season. The story continues as Rick, Eziekial, and Maggie lead the fight for freedom. The episode was exciting but nothing out of this world. This season opener was a little low key compared to past season premieres. The best part was seeing a future Rick and the idea that age was creeping up on him. The scene came in the form of a vision (this was how Rick saw his future.) Rick saw his family, Michone, Carl and maybe 8-year-old Judith; she looked around 8.) living a happy life. He also visualized the expansion of Alexandria. I know the festival they were referring to was in the comic books, so it was nice to see that reference in the vision. I have a feeling that this season will take place over the course of hours and days when it comes to the war. I think that they already know where they want to take the show and how long it will last. I got a Better Call Saul feeling when I saw older Rick. I think the show will last until season 10. I hope it lasts longer, but I can’t imagine the actors playing these characters past 10 seasons. We will have to wait and see. Now the end of the episode was very interesting because Gabriel left Rick to save Gregory and Gregory left Gabriel to die in the middle of the herd. Gregory is a piece of crap and should have died a long time ago. Gabriel was put in a bad situation and soon found himself in a trailer in the dark with Negan. This cliffhangs the episode, so we don’t know what is going happen, but I really hope that Gabriel opens fire on Negan and goes out the best way he can. In the scene Gabriel allows Negan to talk way too much, but at this point, it may be too late for him to react. I would be surprised if the two work together as a team to get out of there alive. What if Negan throws Gabriel out to get the Walkers attention and then makes a run for it? This could go so many ways, and I’m so excited to see what will happen next week. Overall the episode was good, and it was great to see all the cast members interacting in one episode. I know it will be a great season!! Norman Reedus, star of AMC’S hit zombie apocalypse show, The Walking Dead, graced fans this past weekend with a live Q and A session at the Montclair Film Festival. The event was hosted by Joel Stillerman, AMC’S president of Original Programming. Stillerman asked Norman a series of questions that allowed fans to get an in-depth and personal look at the Boondock Saints actor. Norman’s down to earth attitude was infections as the crowd listened to stories about Norman not being the “cool kid in school.” He talked about how his life has been impacted by fame, and how it hasn’t changed him as a person within. We all shared a sympathetic “awww” when he talked about having cameras in his face all the time and deciding to eat his lunch in the bathroom on a plane. Stillerman mentioned some of Norman ‘s earlier work and revealed that he loves photography. He showed two of Norman ‘s published photo books and openly discussed his passion for “capturing dark moments, but seeing a light within that darkness.” He discussed the close relationship he had with his mom and he talked about his new venture with his friends, expressing his love for motorcycles and the open road on his new show “Ride with Norman.” TWD was mentioned several times, along with his close and loving relationship with cast-mates Andy Lincoln and Steven Yeun, but he could not discuss the fate of his character Daryl Dixon. Norman made it known that he has not read the comics and when filming, he just asks some of the cast where the timeline rolls into the story. Toward the end, a few people got up and asked questions. Two became very emotional and Norman got up to give them some official TWD memorabilia. Overall the event was very exciting and it was so nice to see Norman live, up close and personal. I hope that he and some of the other cast members make an appearance at a future Montclair Film Festival event. The Walking Dead season 6 finale excited, shocked, and made us crave for more. The episode answered lots of questions, but also left us asking more questions. The Roller coaster ride continues to go up. Things haven’t been quiet for sometime now. Rick has fully assumed position as leader of Alexandria since Deanna’s death during the mid-season. He has fallen in love and started a romantic relationship with Michone, met Jesus from the Hilltop and has come face to face with arch nemesis Negan. Rick is stronger now than ever, but I fear that his strength will soon weaken once he witnesses the full wrath of Negan. The people of Alexandria are on the verge of loosing everything they have built and tried to maintain within the walls. Daryl started the war against Negan and his group, which was initiated when he blew up the bikers with the rocket launcher. While at the Hilltop Rick learns about Negan. He and the group take on the challenge to get rid of him and his group so that he and Alexandria can trade with the Hilltop. That decision leads the group to Negan’s compound where Glenn makes his first kill and Maggie and Carol are captured. The group does some damage but not enough. They come out victorious, but soon run into a new band of problems as they settle back home. Carol leaves, and Rick sends a group out to find her. Daryl sets out on his own to find Dwight, the sleaze that shot an arrow and killed Denise on a run. He is filled with loss and revenge, but then soon finds himself in hot water just as he stumbles on a captured Glenn and Michone. Something goes terribly wrong with Maggie, as she experiences possible miscarriage pain. Rick and the group gather a few things and set off to take Maggie to the Hilltop where she can get medical attention. On the way, Rick encounters Negan’s group on the road. They are stopped several times and are eventually led into a major trap where a large number of Negan’s men have ambushed Rick and the group. Meanwhile Morgan finds Carol and she confesses that she is ready to die, but Morgan refuses to let her go. She slips away from him injured from her battle with the Saviors. On her travels alone one of the survivors catches up to her and shoots her twice. Morgan finds her again and finally kills the guy to save her. They are recruited by a two men dressed in armor, one of them is the man who lost his horse in episode 15. Those people are from another community called the Kingdom, as it is known in the comic books. Eventually the Hilltop, Alexandria, and The Kingdom join forces to battle Negan’s group. After plan to dodge Negan goes wrong, Rick and the group are all brought to their knees, and are reunited with Michone, Daryl, Glenn, Rosita, and Eugene. Negan finally makes himself known along with his precious bat Lucille. The fear in everyone’s eyes is practically haunting as they all take in the air of death upon their necks. He proposes an offer for Rick-for them to give half of all they have to him in order to stay alive. Negan is dead set on punishing Rick for killing so many of his men. One by one he tries to choose which person to kill. He makes a choice and bashes the head in of someone who we will have wait until October to find out who lost This episode was directed by Greg Nicotero , who by which is an awesome director, but this episode had to be one of the most disappointing episodes I’ve seen in a while. I had a problem with the 90 minutes, and half of a season of building up to such an epic point just to be let down by the end. Jeffrey Dean Morgan had to be on camera for about a whole five minutes, then it ended and we have no clue who was killed. At this point I don’t even think the writers know who they want to kill off. Most of the episode was spent on the group going in circles, and Carol and Morgan’s to die or not die story-line. The special effects were great and there is always something new to see visually. I will spend this time reading the books which will include the new book.